My preview of the Vancouver Symphony's pops concert with Susannah Mars and the Portland Gay Men's Chorus was print in today's Columbian newspaper. Here is a link to the article. Funny stuff. Oregon Symphony delivers a quirky, rewarding Zimmerman, Shostakovich program. The Oregon Symphony put together a program of divers emotional effect on Saturday January 12th. Pairing the brooding intensity of Shostakovich's first cello concerto with Bernd Alois Zimmerman's absurdist Music for the Suppers of King Ubu (with some Rossini and Rimsky-Korsakov thrown in to boot), the programming was ambitious and imaginative. The eclectic opening work by Zimmermann, known for his quotations and pastiche, consisted of eight short movements with a short standup routing by local comic Jason Traeger in between each one. Traeger's bits were (by and large) pretty funny; some were downright scarily insightful and hilarious, fitting for a work that is by Zimmerman's own words a cautionary tale about what can happen to a liberal elite when a dictator takes over. Featuring quotations from Mussorgsky, Bach, Wagner, Richard Strauss and others, the farcical nature of the work established itself right off the bat. The work was littered with honking, squawking eructations from the brass, syncopated eruptions by the percussion--the entire piece was a giant finger in the eye to the elite and their pretensions. Delightful and joyous baroque dances and quotations by Bach ensued in the third movement. In the fourth, entitled Pile, Cotise and the Bear, the tuba and contrabasses seemed to dare the audience not to hear the great beast shambling onto the stage. The Phynancial Horse and the Lackeys of Phynance had all the stentorian stuffiness of a wealthy captain of industry putting on public airs with no pants on. Glorious dissonances from the ensemble, strangely delicate and clunky simultaneously, preceded and ominous, fast-paced executioner's march heading into a quote of Die Walkure and the finale. This was a weird and wonderful piece that was almost too much fun for everyone involved. 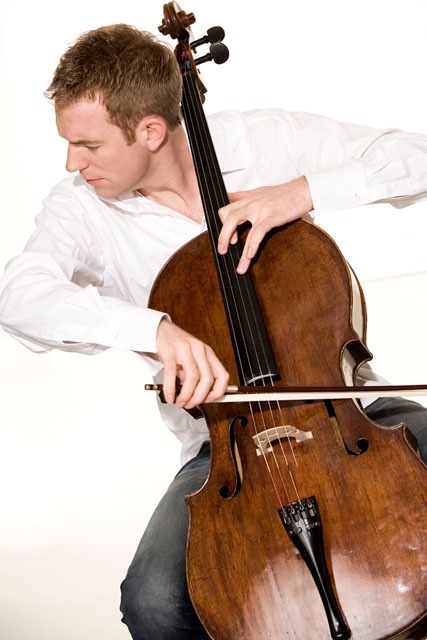 Following a delightful Tancredi overture by Rossini, Shostakovich's Cello Concerto No. 1 in E-flat Major was the meat of the evening. Cellist Johannes Moser, beginning a 3-year artist-in-residence position with OSO, displayed an emotional dexterity immediately. Playing with an almost understated sonority--a pure, thorough and direct realization--he quickly metamorphosed into intense perturbation--a wailing, warbling tremolo that grabbed at the heart strings. Technically, the evenness of the difficult chordal passages and remarkable cantando he brought to bear were absolutely vital to understanding this piece which, like most Shostakovich, couldn't be described as upbeat or effortlessly accessible. His singing passages were subsumed by an incessant, suffocating motility from the orchestra; Moser bore up like a beset wanderer at the center of a tempest. The Moderato was completely different--Moser played it like a lyrical threnody, but almost too weary to be terribly sad. In the high registes he played with the tenderest tremolando, so like a violin, and the trio between the soloist playing harmonics, clarinet and celesta was otherworldly. A prosaic intro in to the Cadenza exploded into an impassioned outburst--varying styles of pizzicato, and a his flawless realization of a fantastically difficult simultaneous pizz and arco section highlighted the amazing breadth of the palette from which Moser can draw. His tenure as OSO's artist-in-residence should be an exciting and rewarding one indeed. The overture from Rimsky-Korsakov's Russian Easter Festival closed out the evening. Concert master Sarah Kwak was in fine form with several lonely, mysterious solo segments, and the trombones were simply glorious in their perfect unisons. This was a great showcase for the ensemble, and an energetic finale to a fascinating, daring and diverse all-around program from Maestro Kalmar and Co.